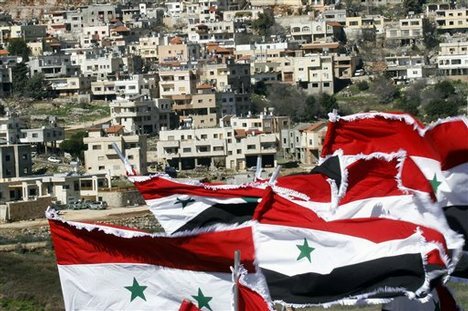 All three articles posted below outline aspects of the economic challenges that Syria faces. AYN AL-ARAB, Syria (Reuters) – Only the old Berlin to Baghdad railway separates the Syrian town of Ayn al-Arab from Turkey’s Mursitpinar, but the contrast between the two sides of the track is so stark they could be on different planets. Potholes the size of craters mark Ayn al-Arab. Side roads are not paved. Sewage runs on the streets and power cuts are common. The land is parched, with farmers draining the water table and worsening the damage from droughts. Across the border in the Turkish town houses are neat, the clean streets are well-lit and the land is lush. Syrians from Ayn al-Arab even use Turkish mobile networks as the service there is regarded as cheaper and better. The gulf between the two towns highlights how far Syria has fallen behind its northern neighbour — which it sees as a development model to emulate — and the scale of the challenge it faces to provide basic services such as road networks, electricity and water to its population. Dilapidated infrastructure and underdevelopment is common across Syria, from the capital Damascus to the eastern region which has been reduced to a dust bowl by four years of drought that ravaged agriculture and displaced 600,000 people, according to a United Nations report. Oil rigs tower above shanty towns in the eastern province of Deir al-Zor, but life in nearby villages along the Euphrates appears little changed for centuries, except for the addition of plastic bags littering the environment. Electricity generation barely covers 70 percent of Syria’s total demand. Even Aleppo, the once great cosmopolitan hub of Anatolia, sinks in darkness as authorities are forced to turn off street lights. Industrialists have pleaded with them to regulate the power cuts instead of randomly interrupting supply. Apart from real estate and the oil sector, which produces a modest 375,000 barrels per day, substantial foreign investment remains virtually unheard of in Syria. A highway project to link Aleppo to the port of Latakia has been delayed, partly by disputes between the state and Kuwaiti contractor Kharafi. A deal with Kuwaiti firm Noor to build a network of petrol stations to solve massive queues went nowhere. Offers to the private sector to finance and build two highways, capitalising on Syria’s location as a link between Turkey and the rest of the Middle East and between the Mediterranean and Iraq, have drawn little interest. Syria, which has been under U.S. sanctions since 2004 for the government’s support of militant groups, does not fare well in international indices measuring corruption and ease of trade and doing business. In the World Economic Forum Global Competitiveness Report 2010-2011, it ranked 109th out of 139 countries in the quality of the education system. Arab neighbours Lebanon and Jordan came 16th and 55th respectively. Syria’s infrastructure was assessed 95th, compared with 35 for Jordan and 132 for Lebanon, where roads and power stations have been frequently bombed by Israel during the past 30 years. The newest power plants were built in the mid-1990s and refineries dating back three to four decades cannot cope with demand, costing the state billions of dollars in fuel imports. Acknowledging the problem, Prime Minister Naji al-Otari said infrastructure will be overhauled “in partnership” with the private sector through Build, Operate and Transfer projects and other arrangements that ease the financing burden on the state. Otari said the Syrian government’s economic achievements so far were “a miracle” and he expected investment to pour in to support the infrastructure projects. But after the woeful inefficiency of state construction companies and criticism of projects given to private firms in the past decades, attracting investment to these new mega infrastructure deals could be a challenge. “You need good quality legal and regulatory framework, which is a weakness in Syria. These kind of projects need lots of guarantees from the government,” said Jihad Yazigi, publisher of the Syria Report online economic newsletter. Electricity generation alone would need investment of $760 million (25.8 million pounds) a year just to keep up with increases in demand, Otari said, adding that the government would be able to cope better if it was not for Syria’s rapid population growth of 2.4 percent. There have been improvements. Two international companies, French Lafarge (LAFP.PA: Quote, Profile, Research) and Italcementi (ITAI.MI: Quote, Profile, Research), are building two cement factories that could help solve shortages after the government gave up its monopoly on the sector. It no longer takes years to obtain a land line in Damascus, and 3G service by private mobile companies have helped improve connection to the Internet. And in Ayn al-Arab, the road leading to the Euphrates river has been upgraded. But the U.N. report this month cautioned that economic liberalisation of the past 10 years — restrictions on private capital into banking, industry and real estate have been lifted — may not necessarily translate into human development. The number of people living in extreme poverty — deprived of food, clean drinking water, sanitation, health, proper shelter, education and information — has increased to as much as 3 million from 2 million six years ago, it said. The lack of basic services is a sensitive issue in Syria. Independent figures who criticised corruption and the government’s economic policy have faced long jail terms. Earlier this year investigative journalist Maan Aqel, who challenged government assertions that there was no African level poverty in Syria and that corruption was under control, was arrested and spent three months in prison. The U.N. report linked economic development with the need to improve rights in the country, which has been ruled by the Baath Party since it took power in 1963, imposing emergency law and banning opposition. In Ayn al-Arab, a Kurdish town of 70,000, the more enterprising inhabitants have escaped poverty by making a dangerous but lucrative business out of illegal ground water drilling. Workshops fill the central street, producing big rigs several stories high and a compact “garden” model designed to slip more easily under the eye of authorities. “Ayn al-Arab’s digging specialists have spread from Morocco to Iraq. But as you can imagine, safety specs are not great, and it’s common for operators to get maimed,” said Mahmoud al-Ghazal. NPR Syrian youths participate in trust games at the Syria Trust for Development in Damascus. Smart and ambitious young Syrians, Amer, Wasseym and Naser Abdulghani’s animation company, Ox Animation, is in demand around the Arab world just a year after launching. But even after achieving moderate success in Syria, the three brothers say they are contemplating a move to business-friendly Jordan. The difficulty of getting credit is just one hurdle facing businesses in Syria. Bureaucracy, poor transport and power infrastructure, and the need for connections this year pushed Syria down the World Economic Forum’s Global Competitiveness Rankings to 97 from 94 out of 139. Wide-reaching economic reforms have been underway since the move towards economic liberalization started in 2005, and the government is pushing for investment and entrepreneurialism by creating industrial cities and cutting red tape. Reforms have met with some success. International brands now line Damascus’ once Soviet-looking streets, industrial city profits have steadily risen, and foreign direct investment jumped in 2008 by an astounding 70% to $2.1 billion, according to Syrian figures. Tourism — and its revenues — has also risen dramatically. But with falling oil and gas revenues, a growing population, high unemployment and ailing infrastructure, Damascus will have to move faster to keep young entrepreneurs like the Abdulghani brothers. One businessman, who asked not to be named, said it had taken him two years, numerous visits to government offices and several bribes to get permission to turn residential premises into commercial, and another six months to get connected to electricity. Rana Shanawani, the head of BIDAYA, a non-governmental organization that gives money and support to business start-ups, is not surprised by the Abdulghani brothers’ experience. It is not just Syrians who find the new landscape difficult. European and U.S. firms are slow to invest, with the majority of money flowing from the Gulf, according to the Syrian officials. Major business players complain of red tape, a lack of qualified staff, low levels of transparency in policy-making and insecure legal rights. Although the Syrian Investment Agency says it licensed projects worth more than $5 billion last year, many have yet to get off the ground. There is some evidence that investment has dropped. While domestic troubles are being solved, the key to future economic success may depend on Syria’s attempt to position itself into a regional hub, analysts say. President Bashar Assad “has worked hard to strengthen relations with regional countries and turn Syria into an energy and transportation center,” says Joshua Landis, a Syria expert at Oklahoma University. The eastern region bordering Iraq is subject to special attention as Syria eyes increased trade and transit opportunities with a future new Iraqi government -– which Damascus is helping to broker. Iraq is already Syria’s main trade partner and the countries agreed a deal last month for Iraqi gas to be piped through Syria to the coast. Eastern city Deir Ezzor will be the focus of investment projects with businesses are given financial incentives to locate there. Two countries agree to restart direct flights, halted for 30 years, in what could signal a thaw in broader relations. La justice syrienne a lancé 33 mandats d’arrêt contre des juges, des officiers, des politiciens et des journalistes de différentes nationalités, libanaise, arabe et internationale, parmi lesquels le juge allemand Deitlev Meilis et son adjoint Gerhard Lemen, a annoncé l’ancien de la Sureté Générale au Liban, le général Jamil el-Sayed dans un communiqué. Ces mandats surviennent au terme de la période de notification, dans le procès intenté par le général Jamil el-Sayed, auprès de la justice syrienne depuis un an, dans le complot des faux témoins et de leurs partenaires, durant les enquêtes relatives à l’assassinat du président martyr Rafic Hariri. L’ex-commissaire allemand chargé d’enquêter par les Nations Unis de l’assassinat de l’ex-Premier ministre libanais Rafic Hariri, Detlev Mehlis, et son assistant Gerhard Lehmann, sont deux falsificateurs ayant fourvoyé l’enquête, c’est ce qu’a révélé un rapport rédigé par le criminologue allemand, Yorgen Cain Kylbel. Selon le rapport traduit en langue arabe par le quotidien libanais, Al-Akhbar, le criminologue affirme que ces deux hommes se sont fondés, dans leurs accusations, sur des dépositions de faux témoins, ayant été achetés. Le criminologue allemand a notamment cité, quand Mehlis a recommandé, fin aout 2005, de détenir pour une durée indéterminée, quatre officiers libanais, et pointer du doigt des responsables syriens dans ce meurtre. Il poursuit que Mehlis s’est basé dans ses accusations sur les dépositions des faux témoins-rois : Zouheir as-Siddik, Houssam Houssam et Ibrahim Jarjoura. Yorgen Cain Kylbel, a en outre évoqué la transaction que Gerhard Lehmann, avait proposée à l’ancien directeur général des Forces de sécurité intérieures (FSI), Jamil Sayed. Lehmann, avait suggéré à Sayed, en présence d’un responsable sécuritaire à l’ambassade d’Allemagne, présenté sous le nom de « E. Stephan », de nommer une personnalité syrienne pour l’accuser d’implication dans l’attentat, en échange de sa libération. Il a notamment demandé au général Sayed de transférer un message verbal au président syrien Bachar al-Assad, selon lequel la Syrie doit accuser une grande personnalité syrienne d’avoir commis cet attentat à l’insu du régime syrien. Une proposition refusée par le général Sayed, qui a réclamé des preuves sur l’inculpation de la Syrie dans cet attentat. Cette offre lui avait été proposée une deuxième fois en présence du duo Mehlis et Lehmann. Le criminologue a en outre pointé du doigt l’administration américaine, avant de conclure que « l’enquête a été falsifiée ». « Raison pour laquelle, il faut blâmer Mehlis », soulignant que « l’Allemagne est indirectement responsable du conflit au Liban ». “IFC officials had said that Syria needed international standards to govern infrastructure projects otherwise financing could be a problem and international banks would hesitate to lend money for companies to do work in Syria. IFC is also advising the Electricity Ministry on modernizing laws and regulations to help assure investors about the risk of making serious investments in Syria and ensure the viability of the project. IFC is the International Finance Cooperation, a division of the World Bank. Read the IGRAA article by Robert F. Worth published in the NYT and above in SC When I Googled the name got the below from the FREE Wikipedia. The msm in the US seems to have its own moderators on Wikipedia. Interesting to say the least about one 60 year old belly dancer by an authoer whose bio has been deleted. Washington (CNN) — During a rare news conference in the United States, Iran’s finance and economic minister held up a copy of U.S. News & World Report from 1980. On the cover was a picture of then-President Jimmy Carter and Iran’s then-Supreme Leader Ayatollah Khomeini with the caption, “Where Will It All Lead?” The issue featured an article about the United States’ tightening of economic sanctions against the regime in Tehran while keeping the military option on the table. The message: Iran hasn’t exactly welcomed the sanctions plaguing the country for three decades. But it has adapted and can continue to do so. Hosseini argued that while Iran faced some economic hardships after the world financial crisis of 2008 and 2009, it has bounced back better than ever, thanks to rising oil prices over the past few years. For example, he said, Iran transferred its reserves from foreign banks and made that capital available to domestic firms. He said doing so has increased internal demands for projects, construction and labor. Many Iranian firms have increased their worth on the country’s stock exchange as a result, helping Iran’s stock exchange to increase a whopping 48 percent in the past six months. That, Hosseini said, is one of the best records for any stock exchange in the world. “When you block the stream of water, it goes another route,” he said. And the sanctions haven’t necessarily hindered external trade, according to the finance and economic minister. Hosseini said Iran’s nonoil exports have increased 23 percent over the past six months, and imports have increased 24 percent during the same period. He added that Iran’s trading partners are “determined to continue” trading. Although Hosseini has been to Washington for IMF meetings in the past, he has kept a low profile until now, as have other Iranian officials who have made rare visits to Washington. Iranian leaders visit the United Nations regularly, but the U.S. State Department must approve their travel to the United States. The United States does not have relations with Iran, and Pakistan represents Iranian interests in the United States. This more high-profile visit could be an effort to show the recent barrage of international sanctions against Iran over its nuclear program has not hurt the Iranian economy, a point Iranian President Mahmoud Ahmadinejad made when he was on the sidelines of the U.N. General Assembly last month. His comments sharply contradict arguments by U.S. and other Western officials that Iran is feeling the bite of a recent round of sanctions in the latest U.N. Security Council Resolution and subsequent, tough unilateral sanctions by the United States and the European Union. “There is no reason to ignore any opportunity to clear the real picture when there is confusion,” Hosseini said, adding that Iran has faced “no substantive obstacle” in finding money. However, he acknowledged countries and private international firms prefer to be discreet to avoid pressure from the United States. Hosseini blasted the World Bank and IMF on Friday for denying Iran development and humanitarian loans, claiming they were not part of U.N. sanctions. “The shocking point is that, based on inquiry made from the legal department of the World Bank, the developmental and humanitarian projects are excluded from the imposed sanctions on Iran,” Hosseini said. He said in meetings with World Bank officials, a “negative opinion of some countries” is cited as a reason for not lending to Iran.